At the end of last Sunday’s Around The Bay 30 kilometre road race, I felt elated. I threw my hands in the air and cracked a big finish line smile. That doesn’t always happen. It was my tenth time racing ATB in the past 15 years. I knew I was nearly 20 minutes slower this year than my personal best of eight years ago (a little over two hours). But my race seemed superior to the previous two years, when I finished feeling defeated, having struggled over the last third of the course. I sat watching other runners come into the finish area, and texted my wife Nichola, who already knew my results, but was wondering about the details. “Was it windy?” she queried. I drove 45 minutes back to Guelph with my running club mates, confident I’d beaten last year’s race time by at least several minutes. After a light meal, a shower and a nap, I settled down to examine the race results, which are posted online even as the competition is underway. Really? Every 10K split over the two years within a very narrow band of 34 seconds? That seemed unlikely. And, how could the two races be objectively so similar, but subjectively so different? In 2017 I had to walk for 50 metres just after the 18K mark, feeling beaten by the wind and worried about still having 12K to run. This year, I powered through the Burlington hills in the last third of the race and finished strong. The two experiences were like night and day. So here’s my answer to the riddle of why things felt so different: predation. That means, being the hunter, and not the hunted – chasing down and passing other runners, instead of being caught from behind and passed by my competitors, especially in the second half of a race. These guys think they’re going to pass me on the next hill, but I’ve got other plans. From the 10K mark onwards I was gradually passing other runners on Sunday, a total of 82 by the end of the race. In 2017, I got passed by 42 runners between 10K and 20K, and then passed 46 runners between 20K and the finish, for a net “catch” of 4 runners overall. Even though I recovered my form in the final third of last year’s race, I couldn’t quite shake the negative feeling that got into my head in the middle third as I slipped backwards. You probably doubt me here. 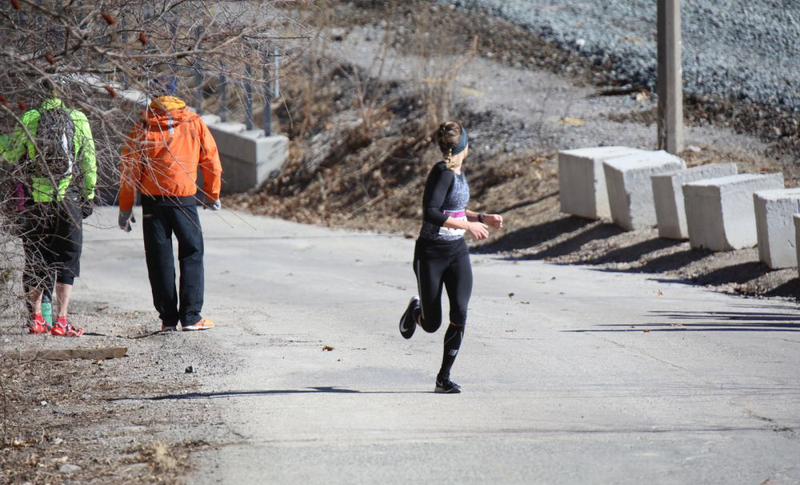 What does passing other runners (or being passed) have to do with anything? And why would it account for such different perceptions of race effort? No doubt, I was fitter this year – my legs still had some zip at 18K as we entered the challenging part of the race, whereas they felt drained of energy last year, under very similar conditions. But road racing isn’t just physical. It’s hugely mental too. Your brain drives your body, and if you’re up mentally, your body also responds, even when it’s under stress and fatigue. So, you can have very similar conditions, but entirely different perceptions. I’ve always suspected there’s an animalistic, atavistic aspect to running. When you sense that you’re gaining on a competitor, there’s some sort of rush – perhaps dopamine? – and you push a little harder to overtake them, which gives you a tiny bit of that elusive runner’s high. Of course, once you pass, then you may become the hunted. The sound of footsteps approaching from behind is a downer, especially when you can’t elude the capture. We runners experience this when we train together on the track. We run short, fast intervals in tight formation, finely attuned to the sounds and pace of the club mates who are close to us in speed. A runner within 10–15 metres, either ahead or behind, is a motivation that can push or pull you through several minutes of effort, drawing you to work harder than is possible by yourself. We rarely talk about this silent competition, but it’s there, and we all secretly welcome the group dynamic that helps everyone run faster. Predation is both subconscious — deep down, we “remember” the day when getting caught meant getting eaten! — and explicitly conscious during a race, when you use your fellow runners as motivation. I know that not all runners approach the sport this way, but most people who race regularly do so because of this competitive aspect. A road race isn’t entirely or even mainly our own thing, or against the clock. 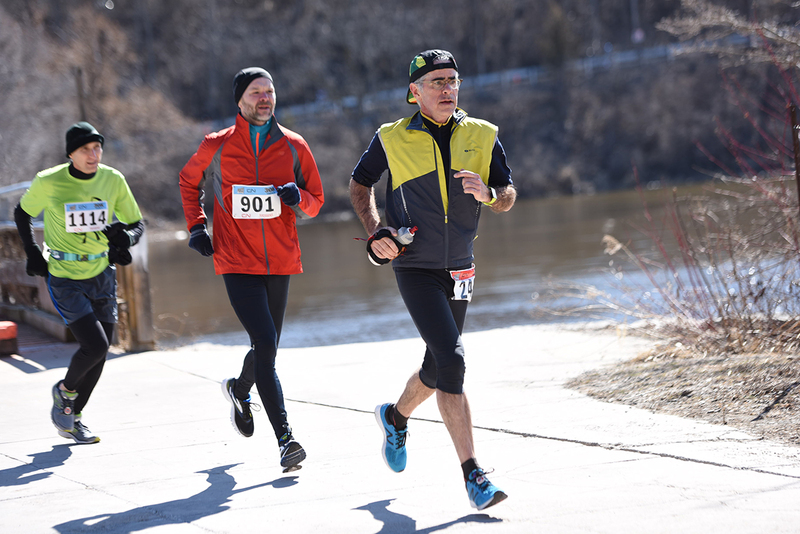 It’s a foot race, against other runners, which harkens back to a time when our lives depended on our mobility, connecting us to something in our animal past. That’s Dayna Pidhoresky of Vancouver who won the women’s race on Sunday — she’s in the lead here with four kilometres to go, but she’s wondering if there’s anyone on her tail. So here’s the “hunt” that was going on for me over the second half of Sunday’s race, and why I felt so positive at the end. As I lined up at the start line, I noticed a couple of “pace bunnies” near me in the coral on Hamilton’s York Street. They had “2:20” written on the cardboard ears they wore. These are volunteers who can probably run faster, but choose to lead a pacing group with a timed objective. Nice, eh? Their job is to run even splits, and deliver anyone who can keep up with them to the finish in the time that’s written on those silly looking ears. 2:20 was around my predicted finish time, but I had no plans to follow the pace group, having always preferred to run my own race, using my watch and effort level as guides. I wanted to run a little slower than the 4:30 pace that I’d started at for the previous two years, and I planned to take a 100-calorie, maple syrup flavoured energy gel every eight kilometres instead of every 10, my usual practice. That was my simple plan for avoiding last year’s mid-race stumble. I lost track of the pace bunnies almost immediately after the race start, and didn’t see them again until we approached the 10K mark, when they passed me slowly with a clump of about 25 runners in tow, mostly young guys. They got about 50 metres ahead of me, but by the halfway point on the lift bridge across Hamilton harbour I’d pulled close enough to hear them talking. The leaders were congratulating everyone on getting to the half in 1:09 and change, which meant they were all on pace for a sub-2:20 finish. But I had no intention of joining the group. I wanted to pass them — all at once — like capturing a huge prey. At 18K we turned west in Burlington and I made my move, cutting the corner, running on the sidewalk, and getting past the whole lot of them with a surge of effort. But I couldn’t slow down. 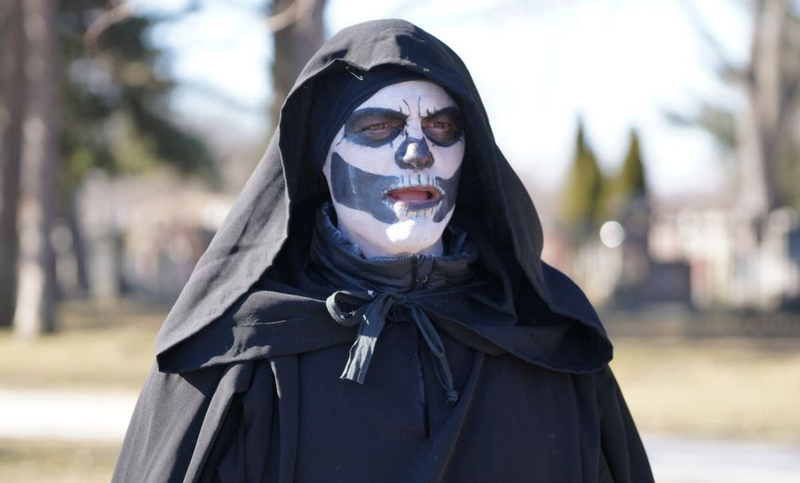 I had to maintain my pace, at least for a minute or two, until I could no longer hear their steps or voices behind me. And so it went for the next couple of kilometres. I never looked back, because I knew they wouldn’t be far behind, definitely within sight, and possibly quite close, which might weaken my resolve to keep pushing the pace. At about 20K, I stopped at a water station for a quick drink. The pair of bunnies and a few followers went by me, but I quickly caught them again. The ATB course is nearly dead flat for the first 20 kilometres, but then rapidly presents you with about six hills in quick succession – just at the point in the race when you are starting to feel fatigued. At first, the hills are small and rolling, then they get longer, ending finally with a monster at 26K that rises 30 metres over a distance of 400 metres, an average grade of 7 per cent that kicks up to 10 per cent near the end. It hurts, but it’s over with in about two minutes. I stayed ahead of the 2:20 group through most of these hills. But on the penultimate climb I slowed a little, and the entire group, now down to about 15, slipped by me. After recovering from the hill I tried to catch them again, which I did within a kilometre, before the big hill. At this point, I turned and thanked the two pace bunnies for their help in the hills, and then ran ahead of them, confident I could maintain a slightly faster pace to the end. When I entered the finish area at the FirstOntario Centre (a 15,000-seat stadium that used to be named Copps Coliseum) I could see that I was going to beat 2:20, and would be under 2:19 as well. I was thrilled for my small, hard-fought victory, hence my finish line celebration. I didn’t realize that my race was so close in result to last year. I just knew the elation that comes from passing other runners, running an even-paced race, and finishing with a smile on my face and a spring in my step. Hi Art: I read your piece about the joys of running a competitive race. It brought back memories when I was young enough and fast enough to be competitive. Of course, i have slowed down, even more that when we ran together on a summer’s day in Guelph. Was it six, seven or eight years ago? I am still at it at 91. My normal routine is up at 4 AM, make the coffee while doing last night’s dishes, then into the weight room for forty-five minutes ( I can still pull down 140 lbs once.) then off for my two-mile run. I struggle to get below 13 minutes for one mile. thanks for Xmas card. Nancy and i send our best to Nicola and the boys. .